The majority of pupils think teaching at school was better than the teaching they got at university, a survey suggests. The study of 1,000 final-year students for private heads body, HMC, suggests private school pupils were particularly disappointed. Some 61% rated school teaching more highly. Meanwhile 42% of state pupils favoured school and 38% university teaching. 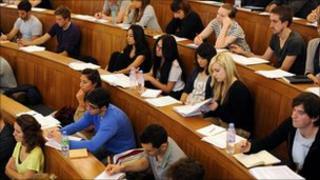 The findings come as universities plan to raise fees to a maximum of £9,000. The study, commissioned by the Headmasters' and Headmistresses' Conference (HMC) to mark the start of their annual meeting in St Andrews, asked the final-year students about their university experiences. Half of those interviewed were from state schools and half were from independent schools. When asked to compare teaching at school and university, less than one-in-five privately educated pupils favoured their university tutoring. Almost two-thirds declared that the teaching they had at school had been better. State school pupils tended to be more equivocal, however with 38% favouring university and 42% favouring school. The remaining 20% said they felt the teaching was about the same. When asked about school teaching on its own, some 98% of private school pupils rated its quality as good or very good, compared with 90% of those who went to state school. For university teaching, 84% of independent school pupils judged it as good or very good, compared with 86% of state school students. The survey also suggests that many students may have concerns over higher fees being introduced in 2012. Just 14% of those quizzed said they would have been happy with the value for money if they had been charged a maximum of £9,000 per year, with 72% saying they would have been unhappy. In comparison, almost two-thirds (62%) of the students, who paid about £3,000 per year for their degrees under the current system, said their university course was good value. Kenneth Durham, headmaster of University College School, Hampstead, north London, and HMC chairman, said: "At a time when school qualifications are under review and when university tuition is coming under greater scrutiny, these findings prove that the independent sector has much to contribute when considering the crucial transition from school to university." He called for much closer contact between teachers in the schools and universities sectors. Nicola Dandridge, chief executive of Universities UK, said it was "nonsensical" to try to compare school teaching with university teaching as they were entirely different things. "Higher education is about students interacting with tutors, lecturers, researchers and their peers and being encouraged to think independently. Teaching excellence at all UK universities is what makes them so attractive not just to UK students, but to students from around the world. "We agree that high quality teaching in schools can have a profound effect on whether a young person enters higher education. Nonetheless, the different but complementary roles played by the schools and universities do need to be recognised."